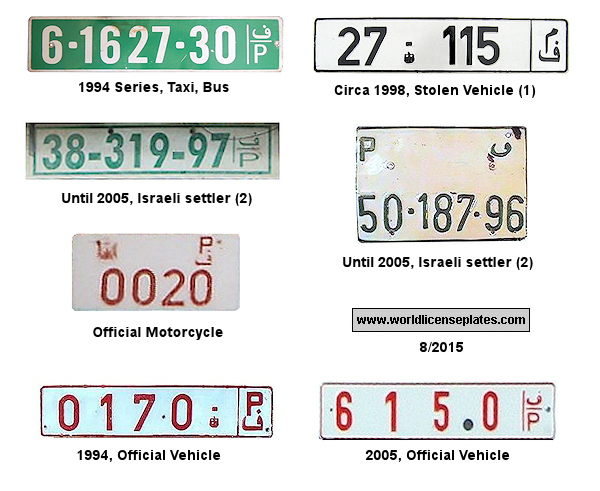 (1) Plate for vehicles which had been stolen in Israel but were legally registered in Gaza: 25 for government vehicles, 26 for police vehicles and 27-30 for privately owned vehicles (shown here). (2) Until 2005, Israeli settlers had green on white plates in the Palestinian style but with a normal Israeli registrations (two numerals, three numerals, two numerals). Capital De facto capital is Ramallah. Constitutional capital is Jerusalem. History After the forming of Israel parts or Palestine became legally part of Jordan (West Bank) and Egypt (Gaza Strip). In the West Bank and the Gaza Strip, occupied by Israel between 1967 and 1994, a Palestine Authority was founded in 1994.